(1) Catfish Corner  A 4 foot diameter hole, starting in about 15 feet of water and opening into a 10 foot by 20 foot room. The spring derives its name from the hundreds of catfish that live there. An ultraviolet light might be a good accessory to bring along. (2) Magnolia Springs  Is an entrance to a cave system that supposedly collapsed in 1963 shutting off the cave system. You can still dive to the entrance room which is about 35 feet deep. 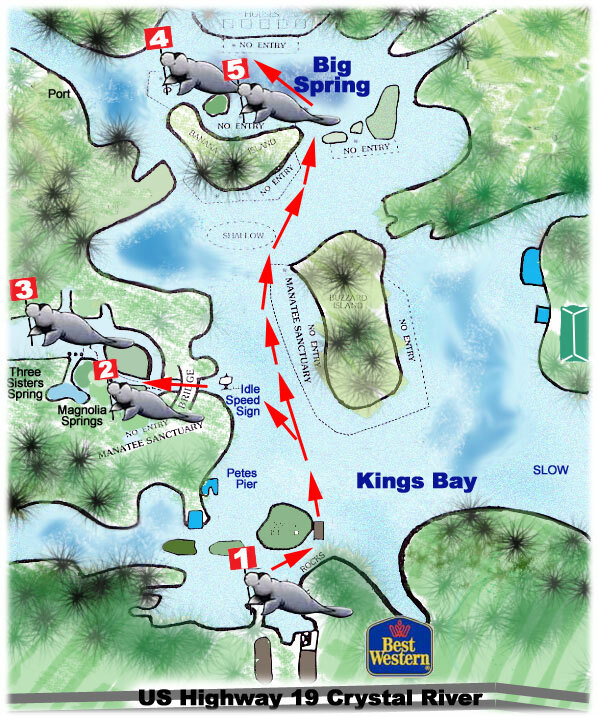 This is a great place to spot manatee in season and there are many fish in and around the spring. No entry between November 15 and March 31. (3) Three Sisters  Consists of three small snorkeling springs. (4) Mullet Spring  Is a series of small springs located about 100 feet east of Big Spring. The flow comes from crevices in the rock bottom. The clear water in addition to the bottom contour offer some great shots to the ultraviolet photographer. (5) Big Spring or King Spring  The largest and most famous spring. Your boat is anchored in about 5 feet of water that encompasses the spring. The spring is about 75 feet across, dropping down to about 30 feet, where there are two entrances to a cave that goes to a depth of 60 feet and goes back about 50 feet. The ultraviolet photographer will be amazed at the bold cliffs and crevices. Silhouette shots are unbelievable. Spear fishing is illegal and please watch for the manatees slow, idle speed from September to March.